On 72nd St. and Greenfield Ave. in West Allis, Wis., stands a storefront window decorated in painted images of a jungle scene - bamboo shoots, insects, lizards, tall trees. The store's name reads "Swords and Dreams" in yellow and "Reptile Rescue" in blue and red. Upon walking in, visitors are greeted by a dated vending machine on one side. On the other sits a plastic jar full of water, quarters, nickels, and a small cup in the bottom. Drop a coin through a slot in the jar's top. Make it in. Win a prize. Hanging from the entranceway ceiling is a paper Easter decoration. Take a few steps and you enter the store. Or is it two? On the left side of the shop samurai swords, battle-axes, and scimitars hang from the walls. Zippo lighters sit in a display case, along with a variety of pocket-knives. Behind a counter, one knife sets sit open. A ceramic deer figurine guards the front window display. Amidst the dozens of weapons, one large turtle lumbers around a bare glass aquarium under the weight of a yellow and green shell. His cage-mates are a thin pile of hay, a faux-rock bath, and an empty paper plate turned upside down. This turtle isn't the only resident of the store. There are about 50 others like him. Swords and Dreams, Reptile Rescue is home to a variety of snakes, lizards, turtles, and even a couple chinchillas. Tom McNeil owns Swords and Dreams. The portly, middle-aged West Allis resident opened the store four years ago. Since then, he's been accepting neglected or unwanted reptiles from owners, landlords, and police departments. His business isn't a non-profit. It's not a humane society. It's a sword shop and reptile house crossbreed. It may not be open for long, though. A tall bookshelf sports a handwritten sign in green: "The store is for sale 60,000 OBO. So everything in the store must go!!!" McNeil says he's been ripped off by an online pet accessory vendor. In addition, new city ordinances have just made some of his reptiles illegal to keep in West Allis. Keeping the lights on and the reptiles warm can cost him between 500 and 800 dollars a month. And as bills pile up, so does the stock. The store is cluttered with trinkets, from kitschy porcelain statuettes to glass pipes to baseball caps. A layer of dust sits undisturbed on his merchandise. McNeil worries that when he closes there will be no place for owners to leave unwanted animals. Rather, they may release them into the wild, where they could harm property, people and other pets, or die during the Wisconsin winter. "We have flooded the market for these animals and we don't have outs for people," he said. Plastic aquarium rocks decorated with imitation moss occupy a laundry bin. A few steps away, customers can grab a bottle of cleaning spray. A few steps away, four large snakes share a cage lined with newspaper. A cat litter box holds their water. Each sits it in a tight roll of scales and flesh, heads buried as far as they can manage in the layers. Their aquarium is one of many against the wall. In a far corner, a pair of grey chinchillas is just waking up. They sniff at their breakfast - a bowl filled with bran flakes, vegetables, and chinchilla food. 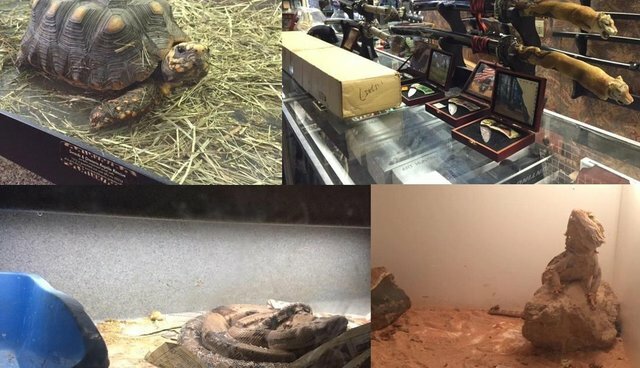 Only some of the cages and aquariums hold animals, as McNeil has begun tapering down his operations. Those that do, McNeil has decorated with porcelain floor tiles to achieve rocks. Most are lined with newspaper, some with sand. One bearded dragon shares his space with a small skull figurine and a plastic cactus. "I try and replicate where they come from," said McNeil. Empty cages are now storage space. Bria Fuchs is a West Allis resident. She stopped into the store to keep out of the cold and "check out some cool reptiles". She eyes a cage holding a light-brown bearded dragon. Would Bria adopt a scaly critter like him from McNeil? "He can keep them here," she said with a smirk. She leaves without making a purchase. Deeper into the store, the smell of cigarette smoke becomes thick. McNeil did have a lit cigarette in his hand at the service counter earlier. There's another counter against the store's back wall, but it's difficult to see under a layer of old pet accessories and dust. It doubles as a case that houses a variety of colorful glass pipes. Close by, dream catchers hang from a wire display. Before McNeil dived into the reptile rescuing business four years ago, he sold a lot more dream catchers at another store he used to own. They became the inspiration for the present store's name. In a corner adjacent to the buried counter are two more aquariums, stacked one atop the other. The bottom is home to a massive constrictor. He's asleep. His patchily peeling body expands and contracts just slightly with each breath. The constrictor's cage is lined with newspaper, a portion of which is covered in a thick layer of a dry, yellow substance, presumably urine. A cat litter box that may have once held water is empty, save for a bit of dirt at the bottom. Yet another monstrous constrictor occupies the top aquarium. His setup is almost identical - empty litter box, tiles - only this snake has attempted to bury himself under the newspaper foliage. According to McNeil, these snakes eat a live rat once per week. During the height of his business, McNeil cared for about 200 animals at Swords and Dreams. All of the care he did himself, as he is his only employee. He says that sometimes his friends would volunteer, but only on occasion. "It seems like I can't ever get ahead and I'm always behind," said McNeil. "They're all healthy though." He notes that he handles most of the animal's medical care as well. In fact, most of the animals that come to him are in poor health. He refuses to keep those sick or starved animals out of the eye of his customers. It's clear to see his disdain for quarantining sick animals in his "clinic area". There, a wall lined with miniature aquariums holds a variety of new store residents. One bearded dragon stands at attention before his caretaker, but he stands only on three legs. "This is Lefty," said McNeil, pointing out a rounded end where a right foot once was. The lizard has one of the more luxurious terrariums. After an online scam cost McNeil $4,000, he can't afford to give all of his animals high-end homes like Lefty's. About four years ago, McNeil sent the money to a company called Critter Condos to buy a number of lavishly furnished aquariums. The business touted itself as an online pet supply store specializing in the crafting of specialty cages. McNeil only received 17 aquariums. He was supposed to get 55 more, but never did. Scams haven't been the only difficulty that has made McNeil's operations more difficult. A lawsuit has cost his business almost $1,000 dollars. A new city ordinance that bans certain snakes is making some of his residents illegal. The legislation, signed by West Allis Mayor Dan Devine in February, makes it illegal to keep venomous snakes and constrictors longer than 4 feet, weighing more than 20 pounds. "There's a bunch of people who don't think snakes belong in a residential neighborhood," said West Allis Alderman Martin Weigel. He notes that there was little resistance by other Common Council members to passing the ordinance. It's not just the snakes that the city is trying to avoid, however. It's health issues brought on by the snakes' food: rats. McNeil has bred them in his store before. He says he doesn't anymore. To McNeil, ordinances like these seem like efforts to shut him down. "I'm not their problem. I'm their answer," said McNeil, who suspects that some residents hiding numerous animals in their homes will not have a place to send them when he closes the doors to Swords and Dreams. Weigel says that McNeil's store is part of the reason for the recent ordinance, but it's not aimed at him. Rather, it's an effort to fill a void in necessary legislation. McNeil doesn't quite know what the future holds for animals like Lefty. No one has offered to buy his store yet. Ideally, he'd like the city or state to continue his work on a public level.